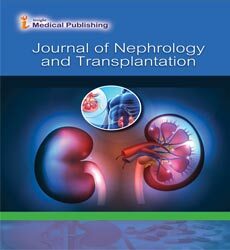 Journal of Nephrology and Transplantation is a peer reviewed journal that aims to publish research dealing with kidney and the various renal diseases like Renal Osteodystrophy, Lupus Nephritis, Renal Cancer, Urinary Tract Infections etc.The journal focuses on the various aspects of nephrology research like Renal Replacement Therapy, Onconephrology, Kidney Biopsy, Preemptive Transplant etc. The primary focus of the journal lies in exploring the various renal infections and diseases and the mechanisms underlying these conditions. The journal also explores the leading-edge technology for the treatment of the various renal disorders. Journal of Nephrology and Trannsplantation has assembled together renowned scientists in the Editorial board. All the manuscripts are subjected to vigorous peer-review process to ensure quality and originality. In addition to research articles, the journal also publishes high quality commentaries reviews and perspectives aimed at encapsulating the latest knowledge that synthesizes new theories and treatment strategies for the better management of the renal infections and diseases. The team of Journal of Nephrology and Transplantation takes immense pride in providing a streamlined and unbiased publishing process. Our journal provides an encouraging platform to the scientists for sharing their valuable research in the field of nephrology. Journal of Nephrology and Transplantation is an academic journal which aims to publish most complete and reliable source of information on the discoveries and current developments in the mode of Research Articles, Review Articles, Case Reports, Short Communications etc. in all areas of the field making them freely available online without any restrictions or any subscription to the researchers worldwide. A clear view of the peer review process can be accessed by clicking here. The study of medicine and paediatrics in context to renal disorders and their treatments is called clinical nephrology. It deals with the various methods like proper diet, medication to treat the renal disorders. It is branch of nephrology that deals with the diagnosis and treatment of various renal diseases like Glomerulonephritis, Kidney Stones, Acidosis, Wilms Tumour etc in infants, children and adolescents. Most of the dialysis supported patients agonize with Renal Osteodystrophy. It is a medical condition in which the kidney fails to maintain proper levels of CALCIUM AND Phosphorus in the body due to kidney diseases. Related Journals: Medical Reports & Case Studies, Annals of Clinical and Laboratory Research, Journal of Clinical & Experimental Nephrology, Clinical Journal of the American Society of Nephrology, Nature Reviews Nephrology. It is treatment that filters and purifies blood in the body in the cases of renal failures. It is performed using a specialized machine. Dialysis prevents the accumulation of salts and water in the body just like the natural function of the kidneys. Related Journals: International Journal of Neurorehabilitation, Peritoneal Dialysis International, Journal of Renal Care. In situations of acute and chronic kidney injuries and renal failures the blood filtering function of the kidney is replaced by Renal Replacement therapy. Kidney transplantation is one kind of renal replacement therapy in which a donor kidney replaces the old kidney. A compatible graft is required to carry out kidney transplantations. Related Journals: Journal of Nephrology & Therapeutics , Primary Healthcare: Open Access, Journal of Clinical Case Reports, Journal of Kidney , Journal of the American Society of Nephrology, Kidney International. It is a rapidly growing new discipline under oncology which deals with the various kidney diseases in Cancer patients. The various aspects of Onconephrology include study of effect of chemotherapy on kidney, study of Syndrome of Anti diuretic hormone common in kidney cancer patients etc. Related Journals: Medical Case Reports, Journal of Carcinogenesis & Mutagenesis, Journal of Nephrology & Therapeutics, American Journal of Kidney Diseases, Seminars in Nephrology, Nephrology Dialysis Transplantation. The procedure of extracting kidney tissue for laboratory study is called kidney biopsy or Renal biopsy. It is commonly performed to examine the potential kidney diseases in a patient. It is often used to examine the various kidney treatments formulated by researchers. A renal biopsy can be percutaneous or surgical in nature. Related Journals: International Journal of Neurorehabilitation, Annals of Clinical and Laboratory Research, Kidney International Supplements, Current Opinion in Nephrology and Hypertension, American Journal of Nephrology. Vasculitis is generally regarded as an allergic reaction to a medicine. Vasculitis leads to the inflammation of the blood vessels in the body. Generally, Kidneys are effected by small vessel vasculitis, also called Wegener’s granulomatosis. It is a type of autoimmune disease of the kidneys. The cells of our immune system cause inflammation in glomeruli by attacking them and hence categorized as an autoimmune disorder. Chemicals, heredity, pollution, infections etc. are some of the reasons for the occurrence of Lupus Nephritis. A preemptive transplant is also called an early transplant since it is done before going on dialysis or after some time on dialysis. It is considered beneficial because preemptive transplant faster recovery because an individual remains in good health in the earlier stages as compared to the later stages of the kidney failure. The infections that affects the part of the urinary tract are called urinary tract infections. There can be various reasons for these infections like bacteria, heredity, fungi etc. They can be treated using antibiotics in primary stages while long course of medication is required in complicated cases. Related Journals: Journal of Kidney, Journal of Nephrology & Therapeutics, Journal of Renal Nutrition, Nephron – Physiology, Scandinavian Journal of Urology.